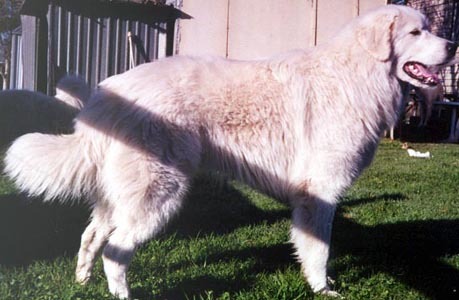 Shadow would have to have been the maremma lists favourite dog, if one can be so bold as to chose a dog to make such a statement about! Tragically killed by a paralysis tick (Ixodes Holocyclus) in November 2000. Everyone knowing Linda and knowing Shadow himself feel his loss deeply, and will miss him with Linda always. Always the clown, and in for a good time. When I visited Linda, he was the perfect gentleman, and I was so honoured! Pictured here is me lying in his arms, patting Ted (which was surprising in itself), Reaper on the other side of me, and Rellie lying nearby. Rest in Peace Shadow, you were loved far and wide, even those who never met you loved you as though they knew you deeply.